Yes, biodiversity is a problem for any young-earth supposition. Note, contrary to YEC assumptions and rationalizations, the bible explicitly defines kinds in Leviticus 11 (and elsewhere). Kinds of ravens; kinds of hawks; at least three locust/grasshoppers, each specified after its kinds, and beetles after their kinds (though the word might have been another set of locust type insects). Kinds is not genera or family, but species, or from Leviticus (and the bird list is reiterated in Deuteronomy), we must allow subspecies, by the modern definition. By the way, what bird or insect of any kind goes about on four feet? (Four, not six, not two–four. Leviticus 11:20, אַרְבַּ֑ע, not to mention bats listed with the birds.) Using the biblical definition of “kinds”, there would have been many thousands of clean ungulates on Noah’s ark. Further, you mention the birds. The bible doesn’t delineate what birds are clean, but rather gives an explicit (though hard to define) list of unclean birds. Accordingly, it is reasonable to assume from the express statements in the bible all the extinct birds were clean, including the enormous flightless birds. Thousands of those too on the ark. A side note on clean: given the many generations Noah preceded Moses, what’s up with “clean” anyway? Life is incredibly diverse. Millions of species fill the seas, land and skies of our little planet. 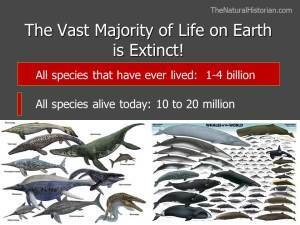 It seems as if there is no end to the discovery of new animals, plants and other life forms. As a biologist who teaches a class about plant diversity, I can always count on discovering a new group of plants that I have never seen before which is always exciting. But what blows my mind even more is the thought that what I see living around me today is but a tiny fraction of the diversity of life that has lived on this Earth. I posted this on my Facebook then decided I needed to record it here. See several translations (especially Young’s) of this one verse here: http://biblehub.com/ecclesiastes/3-19.htm And, note the commentary, and note the, shall we say, backpedaling. Click a translation you like to read the whole chapter. I’ll say at minimum this establishes that death is simply part of the definition of living. It is not wise to ignore the hard things. Young-earth creationists like to assert that they know what the Hebrew word מִין (http://biblehub.com/hebrew/4327.htm) and its variants mean in the Bible. Assuming my internet-based tools (and my skills in using them) are adequate, this word is not actually used in the Bible. The word is translated kind or kinds consistently, but apparently it also means schismatic or heretic. Perhaps worth pondering another day. This isn’t the only Hebrew word translated “kinds” in the Bible, but there seems little use in delving into the others. This one has several occurrences. We should be able to figure the context. If you click through the links above, you see the obvious, the creation account at the beginning of Genesis, then the similar statements in the story of Noah. Now look at Leviticus and Deuteronomy. Here we see the same usage of the word with very specific differentiation. Look at Leviticus 11, starting in verse 13, with the list of birds that are not to be eaten or handled. Eagle, bearded vulture, black vulture, kite, falcon of any kind, every raven of any kind, ostrich, nighthawk, sea gull, hawk of any kind, little owl, cormorant, short-eared owl, barn owl, tawny owl, carrion vulture, stork, heron of any kind, hoopoe, and bat. Look at how clearly the Bible is using kind here and differentiating between kinds of vultures, kinds of owls, kinds of water-shore birds, and bats. Don’t forget that the bible calls bats birds rather than mammals. Clearly “kind” means something much more specific than “family” in biology. The statement about insects is interesting: 20“All winged insects that go on all fours are detestable to you. 21Yet among the winged insects that go on all fours you may eat those that have jointed legs above their feet, with which to hop on the ground. 22Of them you may eat: the locust of any kind, the bald locust of any kind, the cricket of any kind, and the grasshopper of any kind. 23But all other winged insects that have four feet are detestable to you. The statement is that all insects are unclean. Then, well, okay, you can eat the ones with jointed legs for hopping. Then it specifies four categories of locust/grasshoppers and says all of the kinds in those categories. The usage of kind here is consistent with species and subspecies. Of course, all winged insects have six legs, not four. I’m just not sure what to make of that. The passage goes on to lists a few kinds of lizards, and refers the kinds of the great lizard. Again, we must be at least at the level of what we all call species in everyday life. Not families or orders. There is one more use of kinds in Ezekiel 47, where he describes the waters flowing from the temple. Ezekiel stipulates many kinds of fish. It says many kinds of trees, too, but the Hebrew doesn’t use the same word. A transliteration would be closer to “all trees” grow there. So, for sense, all kinds of trees. Neat vision. Not real clear what it means, but it has always seemed to me that Ezekiel was concerned with recording his visions, not explaining them. So, to the usage and definition of kinds, it seems that the common understanding of species and subspecies applies as the Bible itself uses the word. The Leviticus usage (reiterated in Deuteronomy) rules out genus or above for any biblical usage of the word. BTW, everyone knows that moose, elk (all deer for that matter), and giraffe are clean, right? An article in Nature seems to say that inconsequential mutations within our genes and proteins can be as significant as extinction in determining the evolutionary path we living creatures have taken since the beginning. My friends with “design” leanings will assert that God directed these highly improbable events. It is interesting to contemplate, along with all the other improbable constraints that coalesced to bring us to where we are, but the fact remains, these events are natural, not supernatural. The fact remains, it is impossible to please God without faith; it is impossible to come to God without first belief that he is and that he is a rewarder of them who diligently seek him. Can evolutionary biology become a predictive science? The answer to that question depends largely on whether it proves possible to develop a quantitative measure of the role of chance historical events in shaping evolutionary paths. With that objective in mind, Michael Harms and Joseph Thornton start from a database of thousands of variants of an ancestral form of the glucocorticoid receptor to look for mutations paving the way for the appearance of a larger-effect mutation creating a new ligand specificity, and they find none besides the historical permissive mutations. Their result shows that the evolution of this class of hormone receptors is critically dependent on rare non-deterministic events, constrained by protein biophysics. Evolutionary contingency is often seen in terms of chance external forces such as extinction by asteroid impact or climate change, but this work points to the internal organization of biological systems as a further powerful source of contingency. Just an annoying aside: I don’t know why editors allow “non” to be needlessly hyphenated. As to the use of “predictive” in the editor’s first sentence, I suppose he is indicating the use of predictive models based on our understanding of evolutionary biology and mutation in order direct evolutionary change in organisms in order to get new ones with specific characteristics and traits. I think he mainly means we have to understand a lot better before we really move beyond trial and error in these regards. I’ll add that there is plenty of references on the Nature page to keep someone busy for a long time, and many libraries will have free [to use] access to many of the resources. So, you can check it all out expending only your time. One last comment from my studies long ago, a researcher once found that E. coli could consistently beat extreme odds of starving [and surviving] by mutating to eat an alternative food in their culture dish. The story goes that the researcher forgot to add the nutrient to a set of culture dishes one night, and he was disappointed to see his failed experiment the next morning. However, a couple of the cultures had survived. He investigated and found they had mutated such that they could eat an organic component of the culture gel, something that was not supposed to be able to happen. Odds against it were several million to one. So, he tried again with the same results. Then he tried various directed experiments along those lines and kept finding that the E. coli could consistently be extremely long odds. One experiment necessitated a contingent mutation, as the authors of the article here cited discuss. That is, the E. coli had to mutate ineffectively before a useful mutation was possible–a two step mutation pair. The E. coli managed. That is, while starving they mutated in a way that didn’t help them eat, yet that mutation allowed them to make a mutation that did enable them to eat and survive. I’ve never managed to find again the specific references when I’ve tried. Perhaps the information is readily available now, but it will still require the right search. Regardless, such research continues, and the almost limitless variations and abilities of life grow more astonishing as we understand it better. Andrew Wollitzer, Pastor of Berkeley Covenant Church, provides the following sermon regarding science and religion. He mostly tells his own story. He titles it, “Why Should We Care?”. Never lie to your children. Not in the least. Not in any way. Warning: If you came here to find confirmation of your preconceived ideas, you are probably in the wrong place. Regardless, Welcome! I hope you can learn something here in the things I find worth recording. At the BioLogos web site, Graeme Finlay has written an interesting and compelling article about our genetics. He tells his own story, and his writing style is good and easy to read. He points out that cancers grow from a single defective cell. He explains some of the details related to critters with common ancestors. We all know that our DNA is a mixture of our parents’ DNA, and the sequence runs for each generation. Accordingly, my children have genetic markers that my uncle had. With our ever-increasing abilities in genetic sequencing technologies, we can now look at the most minute details of the genome, and what we can see is not only quite observable (something the bully Ray Comfort always asks for), but it is also quite obvious. Dr. Finlay presents the information so we can all understand. I invite you to click the link, read, and see if you agree. Please find the comment button if you care to add anything. I’m always open to comments. When confronted with awkward examples of literalism, biblical literalists like Ken Ham point out that some biblical passages are literally poetry and artistic imagery, and that is certainly true. There are still significant problems that are always ignored, though. RJS (rather than Dr. McKnight) of Jesus Creed posted this article, http://musingsonscience.wordpress.com/2014/03/06/no-interpretation-needed/ where he discusses the tendency of biblical literalism to be more along the lines of philosophical foundationalism, which he asserts is often the same for strident atheists. Flat earth? It is hard to claim artistic speech or poetry with the four corners of the earth. Revelation 7:1, while it is a vision, it is hard to assert it is merely figurative. Revelation 20:8, where the revelator likens the army to the sands of the sea, but at least he indicate that is simile. Isaiah 41:8-9 can hardly be seen as God speaking metaphorically. There is textual uncertainty in that one though. Isaiah 11:12 is a pretty straight forward statement of four corners. There are enough references to corners, and other references indicating the ability to see all the earth from great height (or vice versa), that it is easy to argue for a flat earth, yet nearly all Christians reject the notion. We know good and well it is spherical and has no corners. That is a problem generally ignored by biblical literalists. The bible indicates the earth is firmly established and cannot be moved. The Psalms assert it twice. While obviously poetic, the statement is clear, not presented with an apparent intent of artistic licence. It is reasonable to suppose the Psalms are remembering David’s song when the ark of God was returned, as recorded in I Chronicles 16. Again, poetic, but not presented as metaphor in any way. It seems obvious the biblical writers understood earthquakes, so they could not have been intending to mean the ground never trembles. They seem clearly to have meant the earth was on a stationary foundation that couldn’t be kicked over or disrupted. Again, no one supposes this means what it seems plainly to mean. Another ignored issue among biblical literalists. There is, also, the use of the word for heaven. The bible regularly uses it to indicate the air, where the birds fly, and the sky where the celestial bodies are, and for the abode of God, and then there is the heaven of heavens reference. Real hard to get literal with that much variability in one word. While many of the biblical assertions about heaven, such as where God stores snow, hail, and lightning, can be justifiably taken as figurative, it is quite hard to get around Genesis 1:6-8 when one insists on strict literalness in the rest of the first chapter. These links open each verse with several translation in parallel. Clicking a version heading for a verse will open the chapter in that translation. Note the tool bars toward the top of the pages. The interlinear shows the Hebrew and transliteration, with ready links for the word or (more informatively) Strongs’ rendering of it. I’m not sure I’ve ever even heard of anyone espousing that concept. That is, there are still a few people, typically claiming backing from their sacred writings, that the earth is flat, or that the earth is actually stationary with all the universe revolving around it. (Not only Christians do this.) But I’ve never heard of anyone trying to claim this graphically depicted view that so closely matches the statements in the opening chapter of Genesis. No one in modern memory asserts the universe is filled with water and that the sky is firm enough to separate out some air for the earth to sit in within. I also have trouble seeing how to take literally the waters gathering together in a single place, yet the very next verse refers to seas (plural). It is verifiably obvious that all the water is not gathered in just one place, and the fact is confirmed right there in the remainder of the statement using the plural for large bodies of water.